Ms. Geraldine Flores or Coach Ghie has been serving the showbiz industry from the backstage. Although she also plays supporting roles for GMA and ABS-CBN soap operas, she’s more into gearing up little people who show the passion and love for the trade. She goes beyond teaching how to act. She is proud enough with her product that she acts as stage coach as well when they go for auditions and even when they get roles as background actors and actresses at first. Coach Ghie has been working overseas particularly in Brunei for a greener pasture. But even when she was working there, she still finds ways to teach acting. The limited policies there for the career that she wanted prompted her to come back – even if it means, she has to start from scratch again. Where can you find a coach that is happy enough to spend quality with your kids and impart her talents into yours while you can continue your errands? 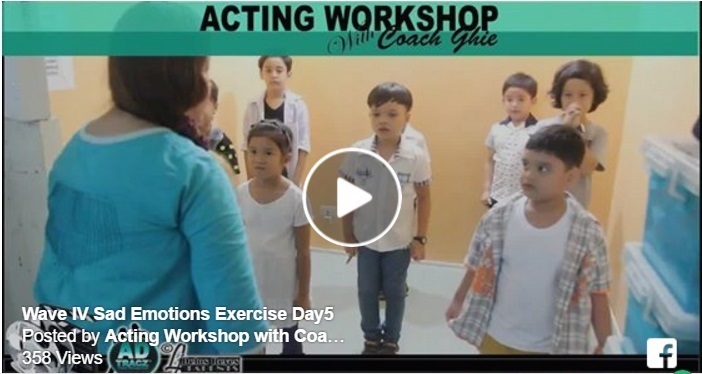 It’s all possible through the Adtracz Acting Work Shop with Ms. Ghie. Just for the love of it. Send her a friend request on Facebook: Geraldine Flores .Then a message through the messenger can surely catch her attention!